I started this painting to be a poured painting. Once I loosely sketched it out – well, I got cold feet. The challenge with poured paintings can be the harsh edges left by the masqueing compound. 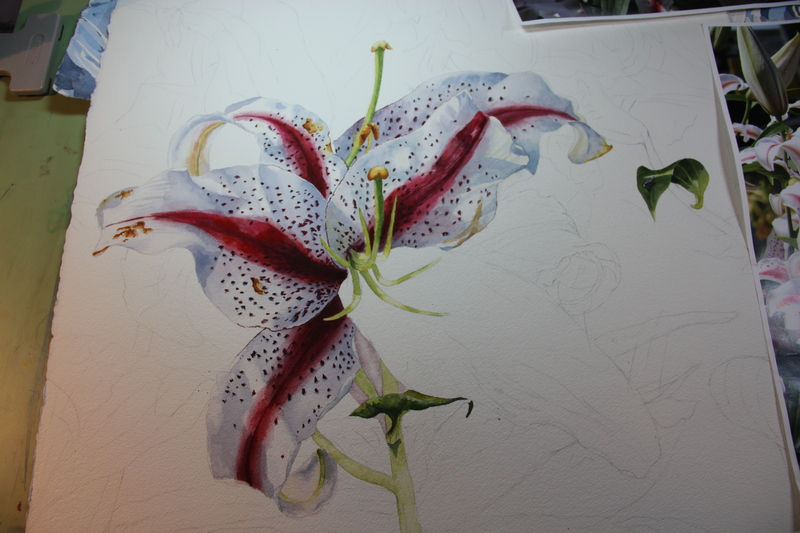 Now I am pretty good at softening all that out, but this lily “Dizzy” is very white and quite red. The white areas would not respond well to all that required scrubbing – and so I decide to paint in my more traditional transparent watercolor style. Sometimes when I am painting, the work titles itself. As I was applying the first red-ish washes, Drama Queen leapt into my head and I think I am going to go for it. 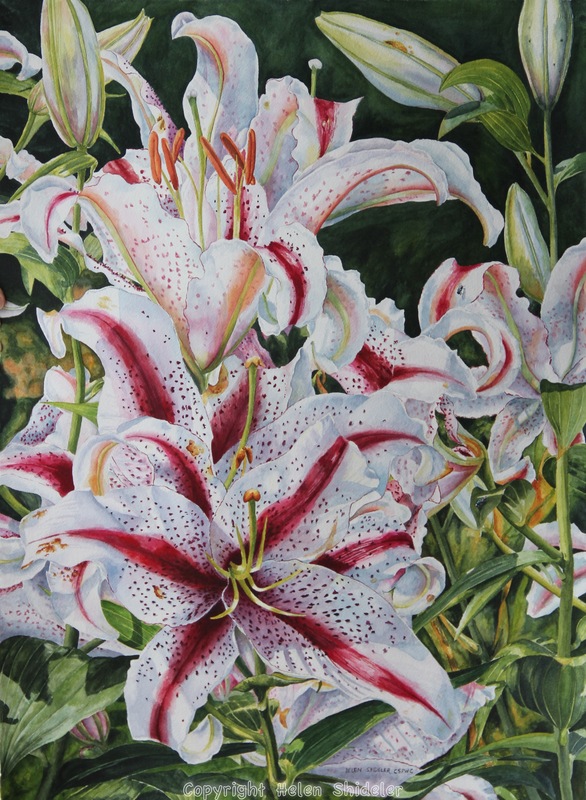 Then I Googled the images I have and discovered it is a lily called Dizzy – thinking the title is perfect now! And, while refining the drawing, outside my studio windows – a catbird was chasing crows with a determination and vocal abilities to be admired – a true drama queen! And so, countless hours, untold amounts of staring and figuring and color balancing… I think this painting is finally done! I spent a lot of time deleloping the foliage. 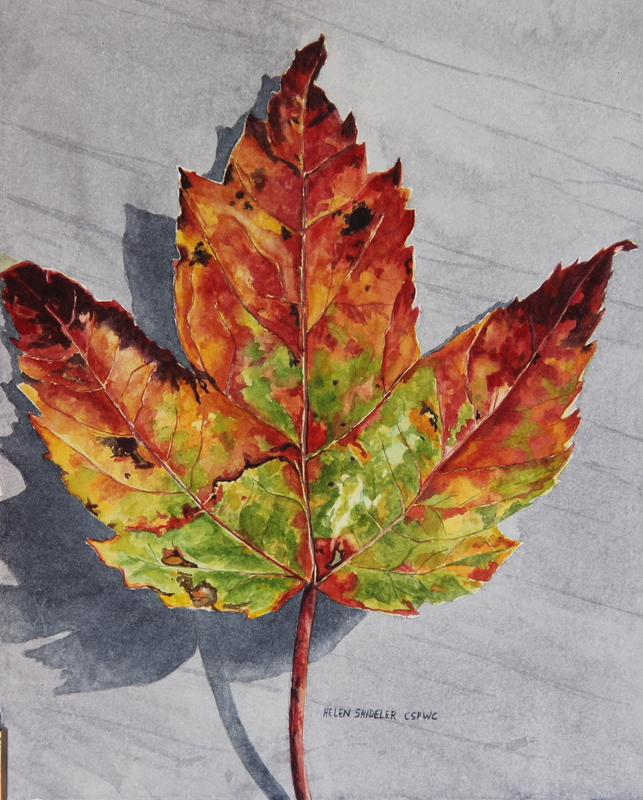 After I thought I was all done – I looked at it with squinty eyes and realized that I had to deepen the colors of the leaves. 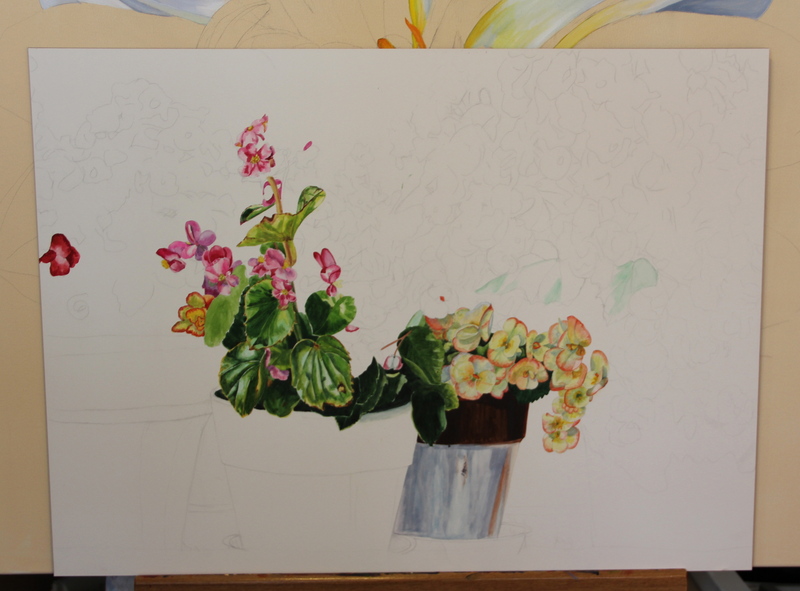 I went back in with a wash of terre vert (a blueish green) and intensified the leaves. And then once again thought I was finished. I fixed up the bug and hung the painting on my fridge – yes my fridge. And am determined no more squinty eyes. Back to our yard in the beautiful Kennebecasis Valley in New Brunswick, where the resident white tail deer population regards planters as their own personal salad bowl! We have a number of wrought iron planter hangers at a variety of heights. Needless to say we have more success with the higher planters. 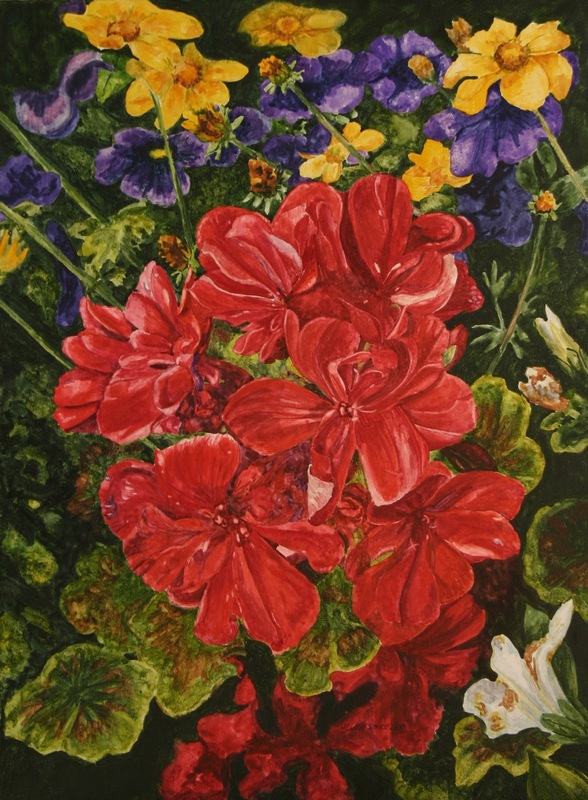 Red geraniums are a staple in our planters, as are petunias and any daisy like flower I can find. I love the mix of color you can plant together and still have it look good. I dabbled over the years with backyard color, various monochromatic then whites and on to what ever strikes my fancy at the time. It almost always comes back to red. Or Yellow. Pure happy colors. And I cannot wait to paint them. 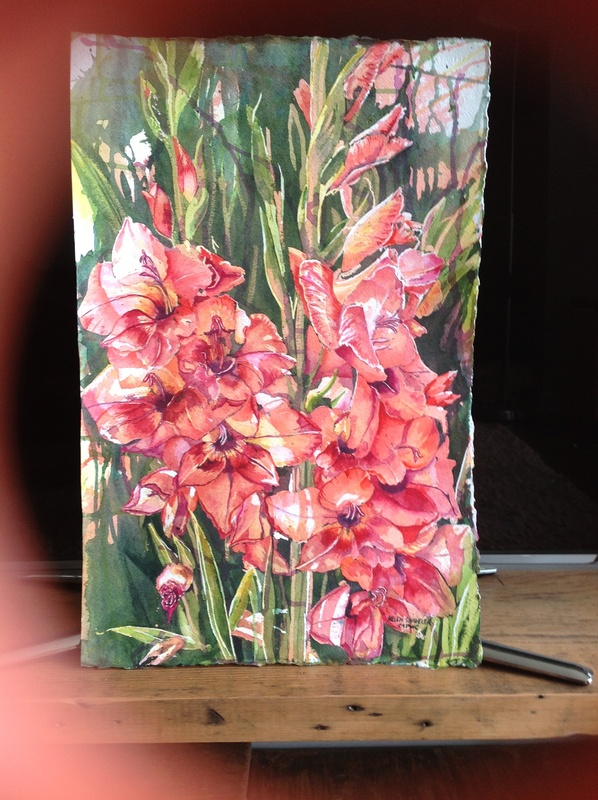 This piece was a bit tricky – tricky to draw out and real tricky to attain depth and contrast while painting with reds. I worked on this continuously for two days. 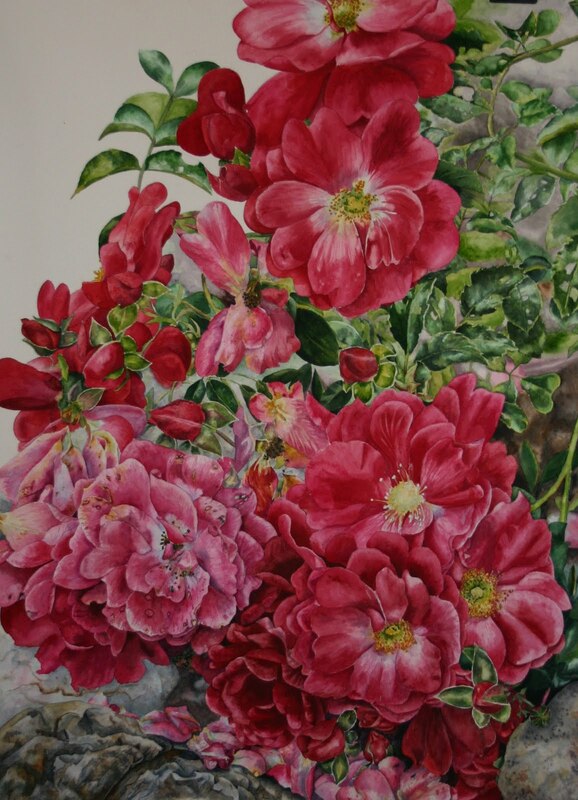 When I finally stepped back to scrutinize my work, I was pleased with the effect of painting red on red. It is dimensional and representational of our back yard basket. 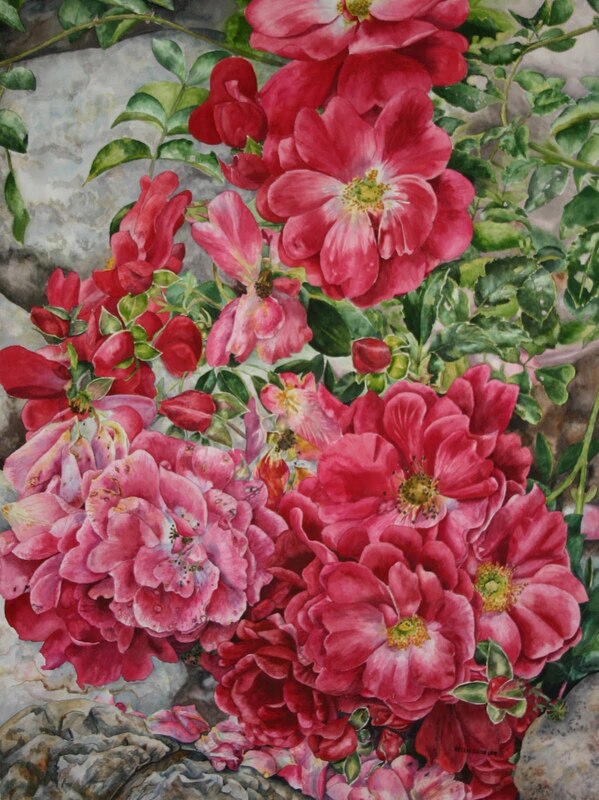 Painted on a 12 x 16 sheet of Ampersand Aquabord with transparent watercolor, sealed with Krylon Acrylic Archival Varnish. 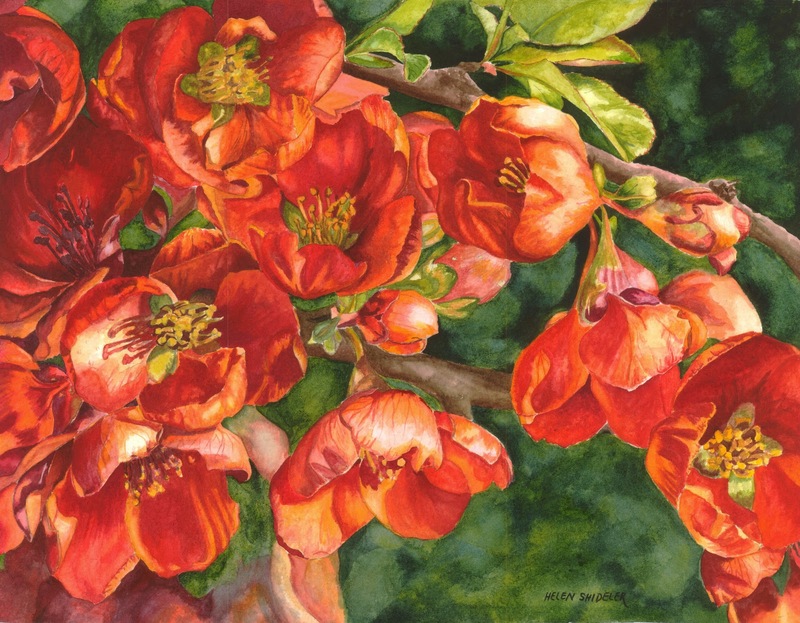 Mid-spring each year, we have a wonderful quince shrub that presents us with a shock of color. I am always surprised and pleased with the display. To the point where we have purchased two more quince shrubs. Interestingly enough, the colors on the two newer plants are quite different from the older original shrub. When we are sitting on the deck and see this blaze of reddish orange at the back of the property, you just have to walk over to admire it up close. Careful not to get too close, it is a thorny shrub. Also somewhat deer resistant which is another reason we acquired two more. 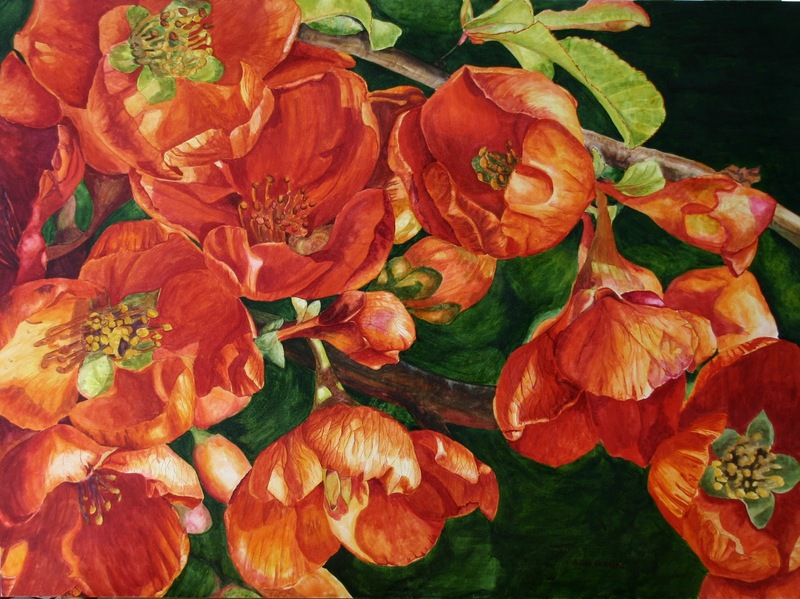 Last year, I completed a quarter sheet watercolor of the quince. 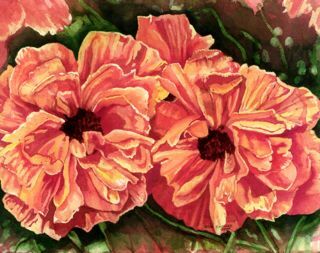 I love how these “vermillion” blooms are highlighted with yellows and yet are contrasted with deep shades of red and scarlet in the shadows. Especially when it is back lit by the sun. 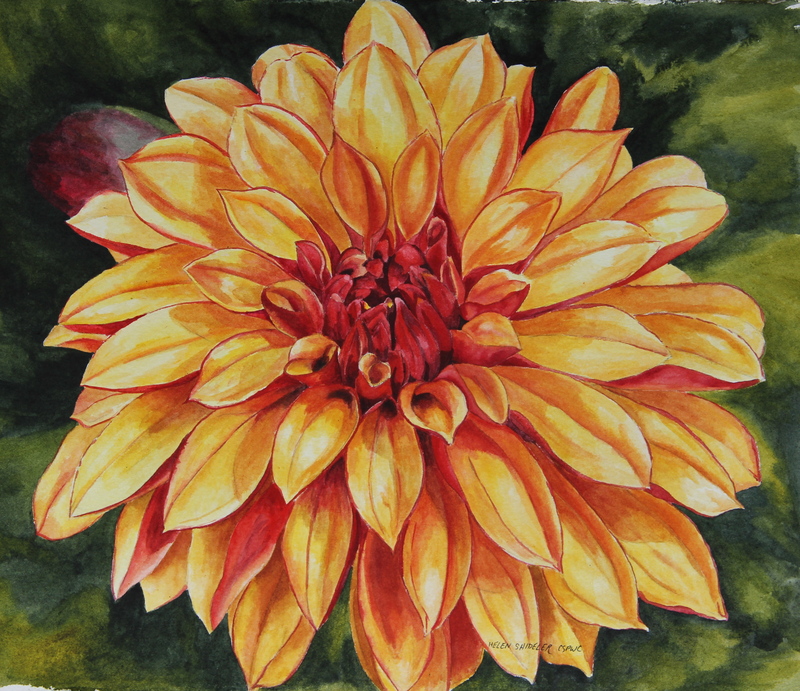 When the smaller watercolor was completed, I was pleased with the painting but thought I did not achieve the overall effect I was striving for. It needed to be bigger so it would present bolder. I drew it out once again on a 22 x 30 sheet of Ampersand Aquabord. The watercolors seem to be more luminous on this material. And the scale of the painting is large enough to create the “drama” I was striving for. So, many weeks later, this is the finished result.